Proportioning of risers and treads in laying out porch steps or approaches to terraces should be as carefully considered as it is in the design of interior stairways. 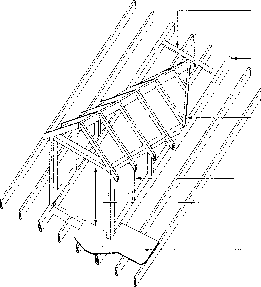 The riser-to-tread ratio should not exceed those for main stairs referred to previously. Outside steps and stoops need good support. If they are supported independently, their foundation should extend below the frost penetration line and be carried down to undisturbed ground. Outside steps and stoops leading to entrances often consist of precast units which are designed to be highly resistant to moisture, frost and impact damage. If concrete steps and stoops are made on site, the concrete should be 5 to 8 percent air-entrained and have a minimum of 3600 psi (25 AAPa) compressive strength.